Making a plant frame. 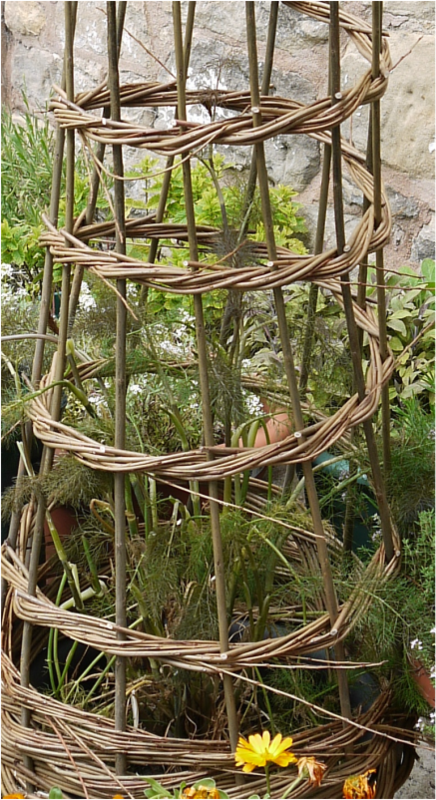 I used 7 foot tall willow rods (Goldenstone) for stakes , dry, with 4 foot willow weavers, well soaked and mellowed. I made a base for the frame with a piece of chipboard drilled with 12 holes and mounted either side on blocks of wood. You can use a cardboard box instead punching holes in with a bodkin or make the frame straight into the ground or pot. This recipe uses a method I adapted from the Isle of Lewis back creel taught to me by Dawn Susan. It keeps the willow weavers from slipping down the stakes and works very well.